MOB's and BM's, bustles and FG's. What the heck does that all mean?? As a new bride-to-be, it is easy to get lost in the lingo and let's be honest, this can add a TON to the unneeded and unwanted stress. So instead of having to use your bridal dictionary to understand each and every word and acronym you're going to be encountering throughout the planning process, I've made it easier for you and compiled all of the most commonly used lingo in one place! Bustle: When you bustle your dress, you basically are making it shorter so it is easier to get around during your reception. The bustle is typically done after the ceremony ad before the grand entrance. They can be found in the form of buttons, ribbon, or small hooks hidden within the dress. Make sure to ask your dress designer where you can find your bustle and how many hooks/ties there are so you can easily find them on your wedding day! Charger: That is the pretty plate that goes beneath the dinner plate. Whether you are having a buffet or a plated meal, no plate is placed on the tables at each place setting until dinner is served. So the charger acts as a place marker while all of the photos are being taken and when your guests arrive! Some chargers are able to have meals placed directly on them, but most are not food safe. Runner: The runner is the long piece of cloth that goes from one end of your table to the other, over your tablecloth. It is used as additional decor to dress up your table! Overlay: An overlay is a square or round piece of cloth that is smaller than your main tablecloth. Sometimes overlays are sheer and sometimes they are solid or patterned. Some are only a couple feet in length and some go all the way to the floor. Boutonniere: The small floral arrangement (not always made with floral) that is placed on the left side of the groom and groomsmen's attire, typically on the button hole on the coat. Typically, all fathers and grandfathers and anyone who is part of the ceremony or wedding party will wear one. Corsage: The small floral arrangement (typically larger than the boutonnieres) that are worn by mothers and grandmothers of the bride and groom. They can be worn on the wrist or on the left side, same placement as the boutonnieres. Fondant: The thick wedding cake icing that makes the cake look smooth on the outside. From experience, people tend to not like the taste. Groom's Cake: A smaller cake that generally is more exicing to the groom and is sometimes a surprise from the bride. Typically, it is decorated based on hobbies and/or interests of the groom. 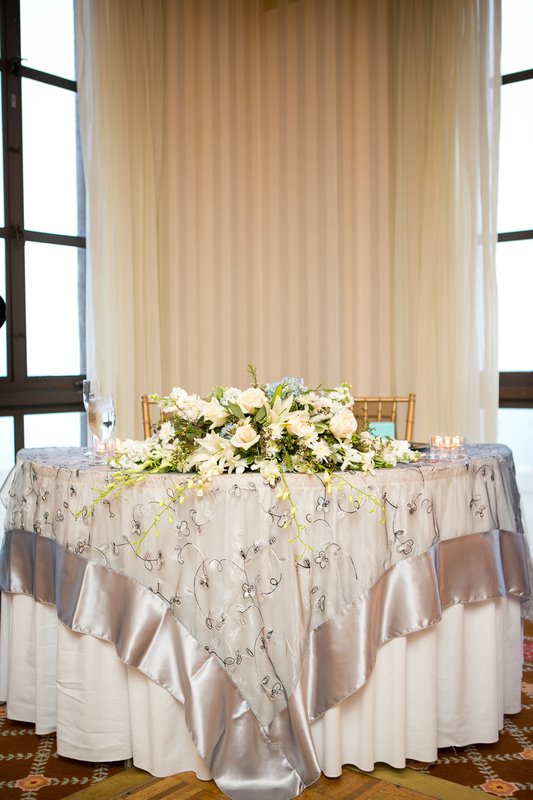 Sweetheart Table: A small table where only the bride and groom sit, separate from the guest tables. Head Table: When the bride and groom sit at a long table with the entire bridal party. From experience, a sweetheart table is better to use when bridal party members have significant others at the wedding, but not in the wedding party. If the head table is used, then they are unable to sit with their significant other at the wedding. If there are any terms that you come across and you have no idea what they mean, comment below or email us and we will be happy to point you in the right direction!